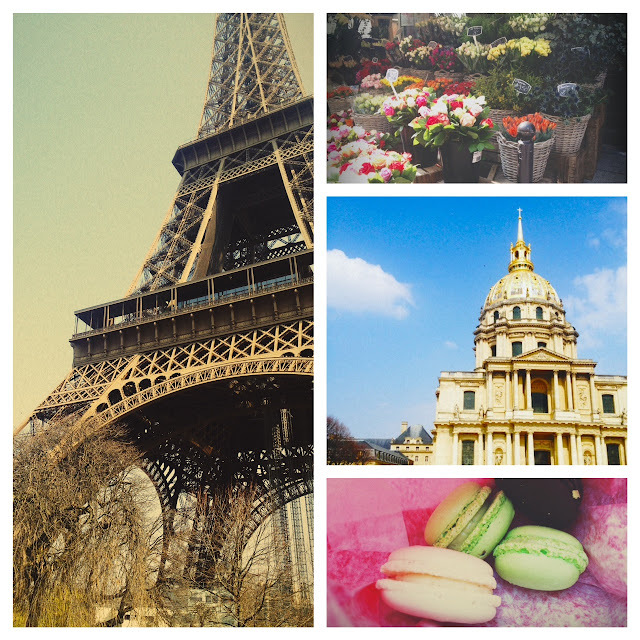 Today was a beautiful day in Paris...mostly sunny, full of delicious food, and some really amazing sights. We let ourselves sleep in a bit this morning due to some residual jet lag, and then grabbed a chocolate croissant on our way to the Metro station. I felt like we sort of fit in as we joined the lunch-rush crowd, nibbling on pastries out of paper bags and walking briskly from station to station. Our first stop of the day was the Eiffel Tower, which is truly beautiful. I don't think I'll ever forget that moment when we walked around the corner and there it was, in all this architecturally astonishing glory. Both of us were content to just stand at the base and marvel at it instead of joining the long line of tourists waiting to go up to the top. I brought one of my old film cameras (the kind that produces square-format photos) and used half the roll on the tower...I can't wait to see how they turned out! Afterward, we walked to Le Petit Cler for lunch and it was SO delicious. The hubs got flank steak and a baked potato; I opted for the poached egg salad, which had spinach, tomatoes, green lentils and haricots verts with a garlicky dressing and a poached egg on top. The street on which the restaurant was located was lined with cute little shops, flower stalls and produce markets, and on our way to L'hotel des Invalides we stopped at a Francois Pralus chocolatier shop for some macaroons we spotted in the window. After that it was back to the hotel for a catnap, and then we wandered over to Pizza Chic for dinner. For appetizers we had papa al pomodoro smeared on bread, and some little grilled artichokes served with the creamiest buffalo mozzarella I've ever tased. Drizzled with some balsamic and it was divine! For the main course I had a four-cheese pizza that had the best pizza crust I've eaten. Overall, it's definitely worth going if you find yourself craving some Italian food while in Paris. your pictures are lovely....i am so jealous!! ah, so jealous! i'm watching funny face as i type, and this was the perfect post to happen upon. can't wait to see your film photos! That is a beautiful shot of the Eiffel Tower. Awesome!